Call us at 406-721-5780 today. For more information or to schedule an appointment with our Missoula chiropractor, call 406-721-5780 today! Chiropractic care has gained considerable credibility in the medical world. Countless people have benefited from the gentle and healing treatments for back and neck pain. ProAdjuster Chiropractic Clinic located in Missoula, MT provides our clients with the most advanced treatments methods available in the Chiropractic World. Our 32 years of experience in the field diagnosing, treating and assisting patients achieve their health and wellness goals has earned us a sterling reputation in the community. We hope to carry on the tradition of positively impacting people’s lives for years to come. Our chiropractic services include: health, wellness and nutritional consultation, orthopedic, neurological, digital x-ray and chiropractic examination. Para-spinal thermal scans, para-spinal surface electro-myograms, and Heart-rate Variability exams to evaluate the Autonomic nervous system. Gentle manual and instrument assisted adjustment procedures using the Pro-Adjuster, Arthrostim, Percusser and activator. Advanced spinal decompression treatments for herniated and degenerated disc conditions in the neck and lower back. Frequency Specific Micro-current energy treatment, whole body vibration with T-Zone machines, and Far- infrared or Low Level Light Therapy for Peripheral Neuropathy. When you schedule a consultation, we discuss your health goals and develop a program that will you achieve them. We help you get the results you want to live a happy and pain-free life. The plans are comprehensive and not only address your care in the clinic but also address all aspects of your life, including your daily routine, diet and exercise. We want to empower you as our client to begin to take responsibility for your own health and welfare and rely less on us. We see patients suffering from chronic back and neck pain as a result of degenerative spinal disease and acute injuries related to car and work related accidents. Chronic pain drastically reduces our quality of life and can damage us physically, mentally, and emotionally. Finding relief is necessary to overcome and put your life back on track. Chiropractic treatments are a natural solution to pain relief. You do not need pharmaceuticals or invasive procedures. Rely on our expertise to find the answer! Every person has a unique set of circumstances surrounding their condition. We consider the personal wishes every patient important. All of our services are affordable and effective. A positive and helpful relationship between our patients and staff allows us to constantly improve and adapt to our patients' needs. Chiropractic can make a positive difference in your life! Visit our office to find out how! Use the exclusive offer above for a free consultation. Dr. Gregory Chapman is a chiropractor serving Missoula and the surrounding area. 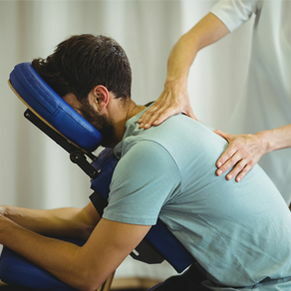 Our chiropractor and the rest of the welcoming team at ProAdjuster Chiropractic Clinic are committed to providing chiropractic solutions to address your unique needs, whether you are experiencing back pain, neck pain, headaches, or even muscular tightness and tension. You may be searching for pain relief after an accident, experiencing an injury, or if you suffer from a specific condition like chronic back pain or a spinal condition. Even if you are looking to improve your overall health, our chiropractor can help you attain your everyday wellness goals! Visit our testimonials page to find out what our patients are saying about our Missoula chiropractor and our chiropractic care plans. At your first visit to ProAdjuster Chiropractic Clinic, Dr. Gregory Chapman will explain how chiropractic care works and give you a full evaluation to see if our chiropractic solutions are a good fit to address your needs. If there is a good fit, we can customize a plan of chiropractic care for your condition and health goals. If you have not been to a chiropractor before and want to find out more, please contact us or call 406-721-5780 to receive the answers to your questions from our experienced team. We also welcome referrals, so we invite you to share our chiropractic and wellness information with your friends and loved ones. Dr. Chapman graduated from the National College of Chiropractic in 1984, now known as the National University of Health Sciences. Prior to 1984, he received his Bachelors of Science from the same school, and his Associates from Worthington Community College, Minnesota. "Dr. Chapman, I appreciate your ongoing commitment to health and your knowledge about a wide variety of ways to help your clients achieve it. As part of this, you recently made available a Thermal Life Far Infrared Sauna at your office. I’ve used it a couple of times and can’t say enough about it. It’s super easy to use. It’s not hard to breathe in like traditional saunas. I always sleep well that night and feel cleaned out afterward. I hope everyone will try it at least once." "I have suffered from back pain for over 30 years. Just this last spring I injured my back again. This time it didn’t go away. After 8 miserable months, I decided to have surgery. I heard about Dr. Chapman and the low back decompression treatment on the radio. I had nothing to lose. Halfway through the treatment, I was feeling so much better I called and canceled my surgery. It’s been 8½ years since my treatment. I can say that I am doing better than I have in years. Thank you very much!" "Approximately 8 years ago I had two low back surgeries. I talked with my surgeon and he said my pain was due to “excess scar tissue." He recommended that I have surgery to remove it. Before the surgery, I heard about Dr. Chapman and the decompression treatment. I decided to try it. I had 20 treatments and I am feeling much better. The pain is not totally gone but it improved so much that I canceled my surgery. I am so grateful. I recommend this treatment to anyone."